It's been awhile since I've posted... I've been enjoying (and getting adjusted to) married life! Last Thursday evening (7/24/08), Shawna and I storm chased in northeast Kansas during what appeared to be a fairly promising tornado setup for July. SPC even issued a tornado watch extending southeastward across the Kansas City area (see the insets on surface map graphic above). 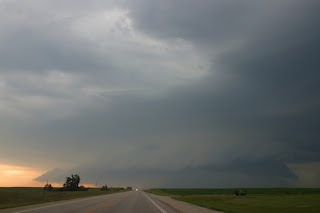 But, apart from a supercell along the Nebraska/Kansas border that rapidly gusted out and moved southeast into a line (see our photo images above), not much happened, and there were certainly no tornadoes. Why? Thunderstorm outflow from morning storms over Missouri had reinforced a stationary front/boundary during the day over northeast Kansas that was quite evident at late afternoon and early evening (see the surface map above). Even though wind shear was strong with easterly winds north of this boundary, temperatures were 10-15 degrees F colder on the cool side of the boundary in extreme northeast Kansas and southeast Nebraska where the original supercell developed between 5 and 6 pm CDT. Radar images above show this storm at 6 and 7 pm CDT, respectively, and its location is also marked with a circled "S" on the surface map above. At Falls CIty, Nebraska (FNB), located just east of where the supercell formed, a RUC analysis profile at 6 pm CDT (shown above) indicated a good wind profile for tornadoes (a clockwise looping hodograph) and good CAPE (instability). BUT, the low-levels were rather stable (blue area on the RUC profile) beneath the CAPE area (red area on the RUC profile). Because tornadoes are a surface-based phenomenon involving near-surface air parcels, this low-level stable area with the cooler surface air may have been a negative factor, particularly because the supercell stayed north of the boundary. I've noticed (as have other researchers) that when supercells form and _stay_ on the cool side of a significant boundary, they are less likely to produce tornadoes than if they _cross_ the boundary from warm to cool, or develop and stay within the warm sector (if there is significant warm sector wind shear, too). 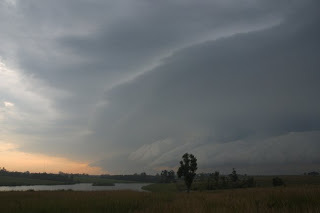 It may be notable that a couple storms that produced surprise tornadoes in north-central Missouri on 7/21/08 (no, we weren't there) occurred on the warm side of a prominent boundary. So the location of the supercell relative to the cool side of the boundary may be one clue in this case as to why no tornadoes happened. In addition, the cooler, heavier surface air on the cool side of the boundary may have made it easier for the storm's outflow to gust out, undercutting the mesocyclone and setting up a more linear configuration. But that's also speculation. Anyway, it made for an interesting storm chase not too far from home (N of Kansas City).